We have added two new Features to Spatineo Monitor to make running your SDI easier: restricted user accounts and improved map zooming features. Would you like your colleagues or partners to see how your services are performing and being used without letting them access all the views and functions in Spatineo Monitor? The new restricted user accounts allow you to name special users who can access only limited parts of the user interface and are not allowed tamper with your service configurations. If you’re interested, contact support@spatineo.com to discuss how you would like to configure the user permissions of your services and we’ll do it for you. The restricted user account has limited views or features available. In this example, only two out of five feature tabs are activated. 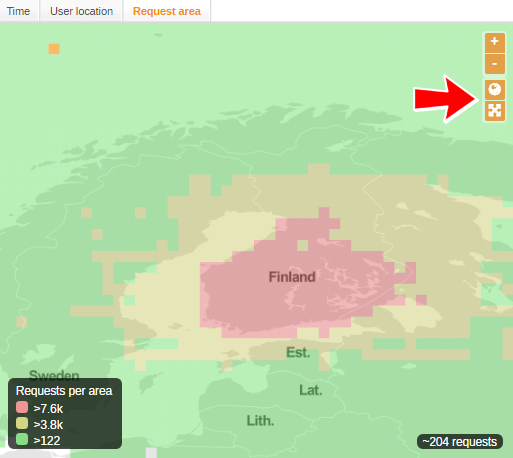 The zoom features of the map showing the user location and request area have been improved. You can now easily zoom into the service bounding box and world map by using buttons on the top right corner of the map. The map also saves the zoom level throughout your visit, meaning that you can leave the Usage Analytics tab and the zoom level remains the same when returning. Use the buttons on the top right corner to reset the zoom and to zoom to the service bounding box.